TRENDFOCUS has just released its latest NAND/SSD Quarterly update. In this report, covering CQ2 ’16 results and the revised long-term forecast, all segments, both client and enterprise, saw another quarter where SSDs posted solid growth. 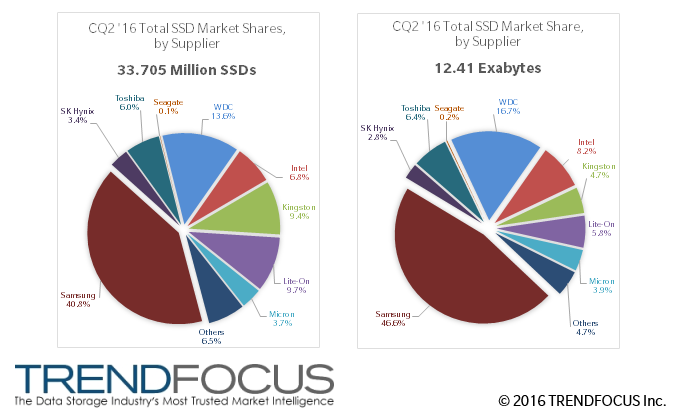 In the enterprise SSD market, all interfaces expanded, reaching 4.068 million units for the quarter, an increase of 10% Q-Q. Each interface is finding success in differing market segments. For SATA SSDs, hyperscale and cloud customers continue to take high volumes of the interface, helping to drive CQ2 shipments of 3.2 million units, or 80% of all enterprise SSDs. SAS SSDs showed some growth, 5.4% Q-Q, but even more importantly, exabytes shipped for SAS SSDs jumped drastically, capturing almost 1/3 of the total 4.16 exabytes shipped for all three interfaces combined. PCIe SSDs topped the 200,000 unit mark, with multiple form factors seeing growth, including M.2 and U.2. As for the client market, unit shipments totaled nearly 30 million units, outpacing the original forecast by 7%. Increases were seen in all form factors and all market segments. Drive Form Factor (DFF) increased a healthy 12.3% Q-Q, driven by both increasing PC attach rates at system OEM along with aftermarket sales. Modules are approaching the 13M unit mark with 13 million units shipped, again a testament to the ongoing adoption by notebook PCs. Of the total 12.41 exabytes shipped in the quarter, client SSDs represented 8.24 exabytes, or 66% of the total. Client PCIe SSDs are now gaining traction outside of Apple, and will become a major part of the client storage ecosystem into 2017. NAND flash bit shipments rose a solid 17% sequentially to 29 exabytes. SSD consumption of the total NAND bit output increased to 42.5%, up a few points Q-Q. Consumption in phones also increased, topping 31% of the total NAND consumed. Although the 3D ramp continues to be delayed from various vendors, 3D NAND, as a total, represented over 17% of all NAND shipped, with planar NAND representing the balance.